Unity Kitchen, the social enterprise arm of disability charity the Camden Society, will be serving up pre-show canapés to the likes of Jude Law, Ben Wishaw and Mel Giedroyc at a charity gala night to raise funds for Ambitious about Autism and the National Autistic Society at London’s Apollo Theatre on 1 July. The social enterprise provides apprenticeships and jobs for people with learning disabilities and profits are re-invested in the enterprise to fund further training and employment opportunities. Three of the six-strong catering team on the night will be people with a learning disability, or who are autistic. Produced by Luke Treadaway and director Katy Rudd, A Curious Night at the Theatre features the world premiere of Simon Stephens and Mark Haddon’s especially-written sequel to The Curious Incident of the Dog in the Night-Time. The new play, a detective story, will feature live performances from Jude Law, Luke Treadaway (as Christopher Boone) and Niamh Cusack as well as filmed performances from Helen Mirren, BAFTA-winning James Bond actor Ben Whishaw, Doctor Who’s Matt Smith and Sherlock‘s Andrew Scott. 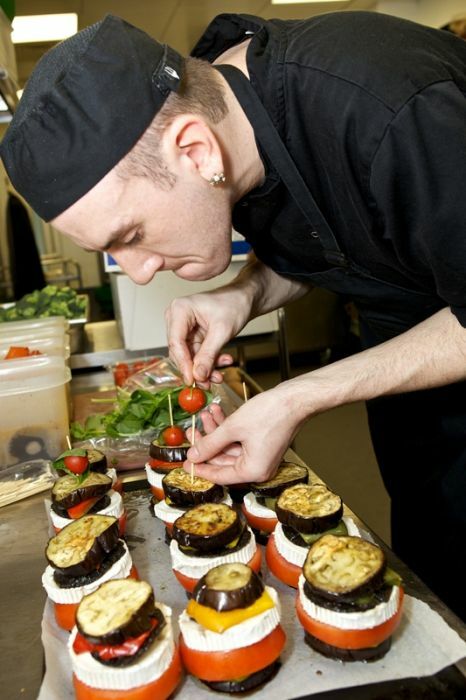 “This event is a fantastic opportunity for our apprentices to gain experience catering for a major event and show that, having gone through our training and apprenticeship scheme, they can make a successful career in the catering industry. Be the first to comment on "Social enterprise caters to the stars at autism charity gala"